A political star was born: Éamon de Valera, in Volunteer’s uniform, hearing the results of the East Clare by-election in July 1917. Having first been reluctant to stand as the Sinn Féin candidate for East Clare in the summer of 1917, Éamon de Valera threw himself into the fray with enormous energy. To enter politics at this critical juncture in Irish history was probably the most important decision of his life. De Valera had been sentenced to death for his role in the 1916 Rising, commuted to life imprisonment, but released after serving twelve months. At 33 years of age he was the senior commandant to survive the executions following the Rising. At first he rejected the proposal to stand as a Sinn Féin candidate. He remembered the public condemnation following the destruction of central Dublin. But when he arrived back in Dublin from prison in England, he saw that a new spirit had taken hold in Ireland. He and the other prisoners received a huge welcome from massive, enthusiastic crowds. De Valera now believed there might be public support for a political route to independence. Although it seems an inevitable step to day, at the time it looked a daunting undertaking. The outcome was by no means certain. Dev was up against the Irish Parliamentary Party candidate Paddy Lynch, a barrister and crown prosecutor, from a well-known Clare family. Lynch was expected to slip into the seat comfortably left vacant by the popular Major Willie Redmond MP, who was killed at the Battle of Messiness Ridge on June 7 1917. Redmond had served the people of East Clare for 25 years, and the party had been a popular supporter of rural and land reform. The IPP considered Lynch a safe bet, and focused their energies on another by-election in Kilkenny. As it turned out the former crown prosecutor proved to be not as an attractive figure as the ‘crown prosecuted’. From campaign headquarters in the Old Ground Hotel, Dan McCarthy organised the canvass with military precision. Dev turned out to be an ideal candidate, addressing up to five meetings a day. Dressed in his Volunteer’s uniform he was accompanied by Eoin MacNeill, who, as chief-of-staff of the Volunteers, endeavoured, at the last moment, to call off the Rising. Following the capture of Roger Casement’s shipment of arms from Germany, he feared it was doomed to failure. This had led to some harsh criticism, but Dev’s healing gesture to his old friend, ensured that Sinn Féin displayed a united front. 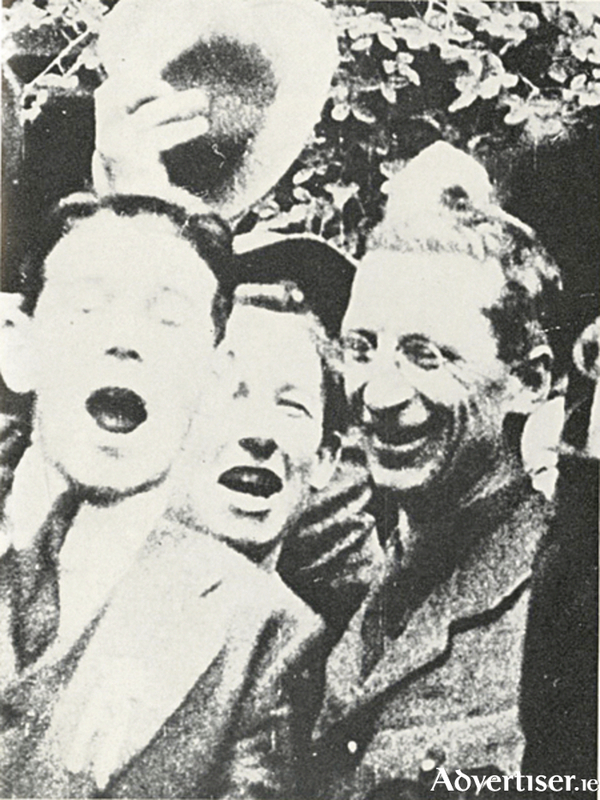 Polling took place on Tuesday July 10 and de Valera swept the boards. He sent a telegram to his wife Sinéad: ‘De Valera 5,010, Lynch 2,035’. Dev was expected to win but the margin was much bigger than anyone guessed. The pro-IPP Cork Examiner said it marked the passing of the old order. Dev said that it showed the world that ‘if Irishmen have only the ghost of a chance they will fight for the independence of Ireland. It is a victory for the independence for an Irish Republic’. For De Valera this was the start of a long political career representing County Clare. He continued to hold his seat in the Dáil until 1959, after which he went on to serve two consecutive terms as President of Ireland. Next week: England takes note of de Valera’s political progress. NOTES: At the same time Dev helped win another by-election in Kilkenny city. The Sinn Féin candidate, nominated at de Valera’s suggestion, was WT Cosgrave, one of the 1916 men that had been sentenced to death and reprieved. He polled almost twice as many votes as his opponent. For 10 years (1922-32 ) Cosgrave was to be prime minister of the Irish Free State. Winston Churchill in his The Aftermath, got in a dig at Dev, by describing Cosgrave as a ‘chieftain of higher quality than any who had yet appeared’. Paddy Lynch, Dev’s opponent in East Clare, did all right too. He converted to Sinn Féin, opposed the Treaty, and in the 1930s became de Valera’s Attorney General. I am taking this week’s Diary from Éamon de Valera wins East Clare by-election by Joseph E A Connell Jr, History Ireland July/August 2017; Éamon de Valera, by TP O’Neill and The Earl of Longford, published by Gill and Macmillan, 1970, and ‘Introducing de Valera, the East Clare by-election an essay by David McCullagh , Century Ireland. Page generated in 0.0850 seconds.